Are bulge stem cells involved in AGA? In the recent study, the researchers first set out to determine whether the stem cells in the hair follicle bulge play a key role in AGA. To do this, they looked at the expression of keratin 15 (KRT15), which is highly expressed by the stem cells in the bulge (which are also keratinocyte stem cells), but not by the cells in the surrounding hair follicle area (Lyle et al., 1998). These bulge stem cells, as identified by high expression of KRT15, have been shown to be small cells that are primarily quiescent (mostly inactive) in vivo, only springing into action when a new hair follicle starts to grow. To investigate whether the bulge stem cells play a key role in AGA, Garza et al. isolated epithelial cells from the heads of people with AGA and compared the expression of KRT15 in cells from areas that were bald to areas that were haired (non-bald). Using flow cytometry, the researchers specifically looked at cells expressing the highest amount of KRT15 (the top 5 percent), a characteristic of the bulge stem cells, as well as the most integrin alpha 6 (ITGA6) (a protein in epithelial basal cells). The researchers found that, surprisingly, the percentage of cells expressing high amounts of KRT15 and ITGA6 were the same in the bald and haired samples. Because this reveals that bald scalp can form even in the presence of bulge stem cells, this indicates that other, unidentified cellular players may be primarily involved in causing AGA. A novel progenitor population involved in AGA: By using other cellular “markers” in addition to KRT15, the researchers found that there was indeed a different population of cells that was present in the haired, but not the bald, epithelial cell samples. (Markers are proteins usually made by distinct cell populations.) Specifically, a population of cells that expressed high levels of CD200 and ITGA6 had relatively very decreased numbers in bald samples. Why did they look at CD200? CD200 is a membrane glycoprotein that has increased expression on the surface of cells in the bulge, and is consequently used to identify cells in the bulge, but it is also expressed in nearby cell layers (Ohyama et al., 2006). Additionally, while the cells it is expressed by greatly overlaps with those that express KRT15, the overlap is incomplete. Garza et al. found that the population of cells expressing high levels of CD200 and ITGA6 did not express the high levels of KRT15 found in the primary bulge stem cell population, and that the CD200/ITGA6-expressing cell population contained only 10% of all of the local cells that express CD200. Consequently, these cells represent a distinct cell population that has not been investigated previously. Additionally, the newly identified population had hallmark signs of being progenitor cells: Garza et al. showed that the cells were slightly larger in size (about 130%) and less quiescent (with slightly fewer cells in the G0 quiescent stage) than the KRT15-highly expressing bulge stem cells. Because small size is often associated with being a stem cell, these cells’ relatively larger size further reinforces the idea that they have a more activated (less quiescent) identity than the bulge stem cells. Based on this evidence, the authors hypothesized that these novel cells most likely represent a progenitor cell population. Enter CD34: Yet more progenitors involved: After discovering the presence of this novel cell progenitor population, the researchers decided to see if there were any other progenitor populations hiding around the bulge that had not been associated with AGA before. They did indeed find another progenitor population, this time with the help of a marker called CD34. A population of cells that lives just below the bulge, in the outer root sheath, was already known to highly express CD34 during the anagen (growing) phase, and then undergo apoptosis when anagen ends (Inoue et al., 2009). Additionally, these cells were already suspected to be a progenitor population that originated from the bulge, although some have argued that CD34 does not truly label a progenitor population (Gutierrez-Rivera et al., 2010). However, in the recent Garza et al. study, researchers again presented evidence supporting the idea that the CD34-expressing population is made up of progenitors (based on relatively low KRT15 production and larger cell size compared to the highly KRT15-expressing cells). The researchers also, for the first time, showed evidence supporting this population’s potential role in AGA; the CD34-positive cells were present in bald cell samples at one tenth the level they were found in haired scalp samples. Where exactly are these novel progenitor populations? Going back to their novel cell progenitor population, although the researchers could tell that it expressed certain markers (CD200 and ITGA6) and had other distinguishing characteristics (a larger cell size and lower levels of KRT15 compared to the bulge stem cells), they weren’t sure exactly where it called home. They used another marker (follistatin, or FST) to find that their novel population had members located outside of the bulge (FST is only in the bulge, but 15% of the novel progenitors did not express it). They also determined that some of the progenitors resided in an area home to the “secondary germ cells.” The researchers discovered this by using two different markers: the epithelial cell adhesion molecule (EPCAM), which stains secondary germ cells, labeled 16% of the progenitors, and the leucine-rich repeat-containing G-protein coupled receptor 5 (LGR5), which labels bulge and secondary germ progenitors, was significantly elevated in the progenitors (and had decreased expression in bald scalp relative to haired samples). Consequently, the novel progenitor population was thought to reside in both the bulge and the secondary germ. This isn’t that surprising though; other progenitors derived from the bulge are known to reside in the secondary germ cells (Ito et al., 2004). During catagen, the bulge produces progenitor cells which make their way down to the hair follicle base. There they are responsible for generating a new hair (mainly the hair shaft and root sheath) at the beginning of anagen. Some of these progenitors can also, amazingly, “dedifferentiate” into bulge cells if a bulge cells are lost when a hair is removed from the follicle (Ito et al., 2004). But none of this had been tied to AGA previously. Multipotent progenitors: Lastly, the researchers showed that their novel progenitors were multipotent and could successfully create hair follicles. To determine their potency, researchers injected the progenitors into immunodeficient mice and, when combined with neonatal dermis, this resulted in the production of all hair follicle lineages, complete with outer and inner root sheaths and sebaceous glands. Concluding reflections and next steps: The findings from the Garza et al., 2011 paper not only help us better understand how baldness in AGA may be caused, but also how AGA may be treated. The authors hypothesize that in AGA bulge stem cells that have somehow become inactivated may result in a loss of CD200/ITGA6-expressing progenitor cells. Because the CD200/ITGA6-expressing progenitors have been shown in this study to be multipotent, generating a number of important hair follicle lineages, this may lead to the miniaturization of the hair follicle, a hallmark sign of AGA. But because there are still stem cells present in all of the hair follicles of patients with AGA, it suggests that the AGA condition may be reversible. The next steps will be to figure out what signals are necessary for the creation of this vital progenitor population, and how stem cells that are still alive in the hair follicles of bald AGA scalp can be used to regenerate the lost progenitors. Furdon, S. A., Clark, D. A. Scalp hair characteristics in the newborn infant. Advances in Neonatal Care. 2003. 3(6): 286-296. Garza, L. A., Yang, C., Zhao, T., Blatt, H. B., et al. Bald scalp in men with androgenetic alopecia retains hair follicle stem cells but lacks CD200-rich and CD34-positive hair follicle progenitor cells. The Journal of Clinical Investigation. 2011. 121(2): 613-622. Gutierrez-Rivera, A., Pavon-Rodriguez, A., Jimenez-Acosta, F., Poblet, E., et al. Functional characterization of highly adherent CD34+ keratinocytes isolated from human skin. Experimental Dermatology. 2010. 19(7): 685-688. Inoue, K., Aoi, N., Sato, T., Yamauchi, Y., et al. Differential expression of stem-cell-associated markers in human hair follicle epithelial cells. Laboratory Investigation. 2009. 89: 844-856. Ito, M., Kizawa, K., Hamada, K., Cotsarelis, G. Hair follicle stem cells in the lower bulge form the secondary germ, a biochemically distinct but functionally equivalent progenitor cell population, at the termination of catagen. Differentiation. 2004. 72(9-10): 548-57. Lyle, S., Christofidou-Solomidou, M., Liu, Y., Elder, D. E., et al. The C8/144B monoclonal antibody recognizes cytokeratin 15 and defines the location of human hair follicle stem cells. The Journal of Cell Science. 1998. 111(21): 3179-88. Ohyama, M. Advances in the Study of Stem-Cell-Enriched Hair Follicle Bulge Cells: A Review Featuring Characterization and Isolation of Human Bulge Cells. Dermatology. 2007. 214(4): 342-351. Ohyama, M., Terunuma, A., Tock, C. L., Radonovich, M. F., et al. Characterization and isolation of stem cell-enriched human hair follicle bulge cells. The Journal of Clinical Investigation. 2006. 116(1): 249-260. Oshima, H., Rochat, A., Kedzia, C., Kobayashi, K., Barrandon, Y. Morphogenesis and Renewal of Hair Follicles from Adult Multipotent Stem Cells. Cell. 2001. 104(2): 233-245. 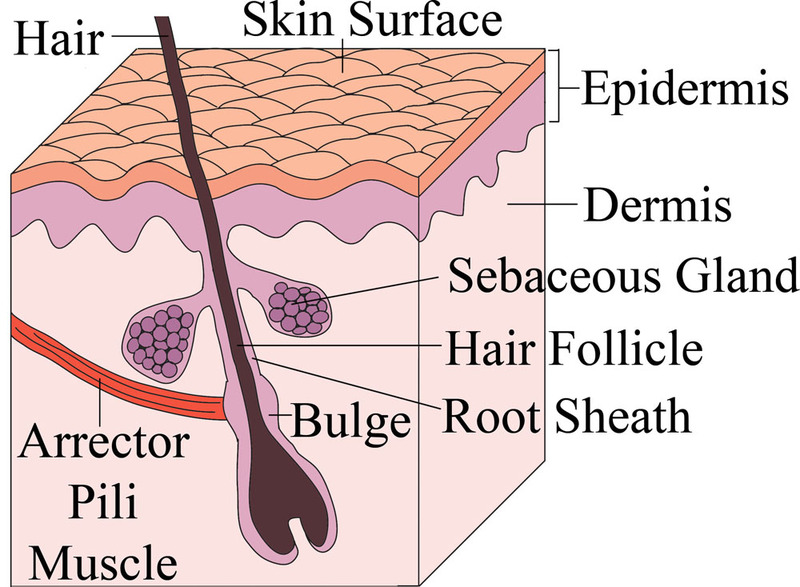 Image of “Hair Follicle” was created by the author based off of images from Wikimedia Commons and other medical resources. admin	Hair Stem Cells	adult, regenerative medicine	© 2009-2010, Teisha Rowland. All rights reserved.